Serene and secluded in a wooded area – 30 Timber Road Bed & Breakfast will charm you, warm you, and relax you. Our Williamsburg-style home is designed with architectural details typically found in historic colonial homes. We prepare breakfasts with your special dietary needs in mind and serve at your convenience. 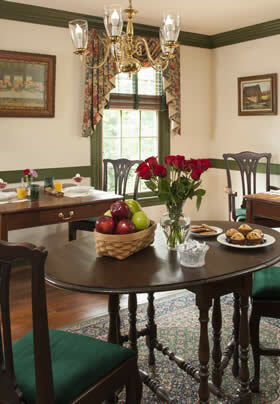 Choose this B&B as your lodging alternative when visiting Carlisle, Harrisburg, Gettysburg, or Hershey, Pennsylvania. If you are working in the Mechanicsburg or Carlisle area, 30 Timber Road Bed & Breakfast will fill your needs as a business traveler, with free Wi-Fi, early breakfast and flexible check-in and check-out times. Parents of students at Dickinson College, Messiah College or Penn State’s Dickinson School of Law will find the B&B to be conveniently located, yet quiet and secluded as well. All guest rooms have been designed with utmost comfort and pampering at the forefront. All guest rooms have a luxurious king-size bed and all have en-suite bathrooms with a whirlpool tub. For your convenience in-room refrigerators and microwaves are in all rooms. High Definition (HD) TVs are equipped with cable connection. For extended-stay guests, two rooms have a full wet-bar for quick, convenient prepared dinners. AND – there’s more! Enjoy breakfast on the screened porch while you watch the white-tailed deer in our backyard. Stroll through the woods and pause at one of the benches where privacy reigns supreme and the bird watching is amazing. We are award-winning, seasoned innkeepers, who have been practicing the art of hospitality for 24 years and still love it. We are genuinely happy to serve you. INNKEEPER’S CORNER: It’s spring! You know its really spring when you hear “peepers” around any pond in south-central PA. Spring shows itself in all the colors of daffodils, bluebells, and flowering trees in the woods. You can hear spring in the bird songs of the Towhee, the Baltimore Oriole, and the Wood Thrush that live in our woods. You know its spring when the Car Shows start happening in Carlisle. You know it’s spring when so many young adults make final visits to Dickinson College and Messiah College – making their commitments to higher education. Make your reservation for a spring getaway and spend some quality time hiking, biking, fishing, kayaking, shopping, and dining in the Cumberland Valley! When you are planning a trip, remember to always Book Directly with your chosen place for lodging or an airlines! When you book direct you have more control over your reservation. At a B&B, you can see ALL the rooms that are available and you can choose the specific room you want. If you have special dietary restrictions or other allergies, it’s easy to contact your innkeeper to make those special requests known. Speaking of special requests – you have more opportunity to add special packages to your reservation. If you need to change your dates or if you are delayed, you know how to contact your innkeeper. Typically, you will also get the best value and lowest price when you #BookDirect! Attention USAWC Students, PA State Employees & Legislators, Traveling Nurses: If you are working in the Carlisle/Mechanicsburg area and looking for an extended-stay “home”, give us a call for special rates and check out our newest amenity for longer-term guests. Our guest rooms have refrigerators, microwaves, coffee makers, and dishware available for your convenience. Feel “at home” when you need to be away from your family for your job. Accessibility Statement: At 30 Timber Road Bed & Breakfast, we want everyone to be able to access our website and learn about our B&B accommodations. Towards that end, we are working to improve the accessibility of our website, and comply with the WCAG 2.1 guidelines. Please know that we are always happy to discuss our facilities, accommodations, and services by telephone or email, and any reservations that you wish to place can also be placed by telephone. Please know that, with only three guest rooms, we are not required to have ADA accessible rooms. We do have one room on the first floor of our B&B/home but being able to navigate steps is required to enter the building. If you have identified an accessibility issue that we have not yet addressed, please notify us at stay@30TimberRoad.com with “Accessibility” in the subject line.